The transitions between states occur with an “Action”, which are not interrupted. The transition is deemed to occur instantaneously with an atomic action that is not interrupted. Within a state we often have an activity that is performed during the objects time in that state. However, the acitivity can be interrupted by an event ( often a transition event ). 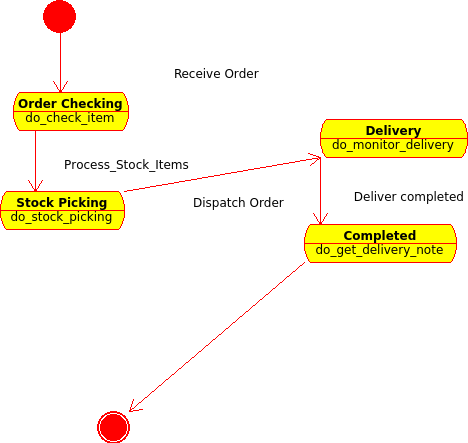 In the example diagram the stock picking state has the activity of identifying each stock item, when this is identified the state transitions back to the order checking state, if the order is complete, then the transition is to the delivery state. Only one transition out of a state may be taken at a given time. It is not possible for two states to run concurrently. In the example diagram, the delivery state is terminated which an signed receipt is obtained. Most often, transitions from a state are guarded, and this means that the transition will only occur if the guard condition evaluates to true. This entry was posted in Uncategorized and tagged C++, Java, real time, software design, Tendron Systems, UML by jamesgoode98. Bookmark the permalink.